So after a LONG vacation..I’m back up and blogging. And it seems like all of a sudden since I’ve gotten back — Fall is here! I must say…fall is my favorite season in the city…between Fashion week, Halloween, the leaves in central park, and amazing fall cuisine (think delish roasted sweet potatoes and baked apples!! mmm) there’s plenty to enjoy. Perhaps one of the things that I’m trying to learn (at the begging and pleading of D) to enjoy this season is….Monday Night Football. As someone who originally thought that a defensive lineman was a type of argyle sweater and that Tom Brady was another member of the Brady Bunch, I’ve decided to tackle football season – Gotham Skinny style. This week’s posts to all things fall football — a delish chili recipe, what to eat at a game, and an outdoor workout that will get you running down the field faster than your average running back. Nothing screams football and fall more than a bowl of homemade delicious chili. Chili can be a great way to meet your protein and veggie needs and pretty much tastes delicious on just about everything (chili on scrambled eggs is a personal favorite and a delicious brunch meal!). 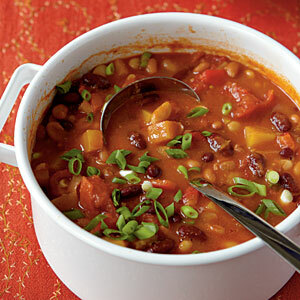 Plus, chili is a great meal to make for a crowd. Here is a vegetarian chili recipe that I have made several times and that is a huge hit (even with meat lovers) it tastes totally sinful but is chock full of veggies and fiber-rich beans. Round it out with some homemade cornbread and you’ve got a taste of culinary victory! 3. Heat a Dutch oven over medium-low heat. Add oil to pan; swirl to coat. Add onion; cook 15 minutes, stirring occasionally. Stir in cumin and next 4 ingredients (through garlic); cook 2 minutes, stirring frequently. Add bell peppers, broth, squash, and tomatoes; bring to a simmer. Cook 20 minutes, stirring occasionally. Add beans; simmer 25 minutes or until slightly thick, stirring occasionally. Sprinkle with green onions. Looks like a nice recipe– I like the idea of squash for fall. I’d suggest substituting a yellow pepper or perhaps tossing in a bit of frozen corn just for visual contrast. I love fall and I love chili! Way to go, GS!